EL Wires and Chasing Wires or Flowing Wires emit a spectacular uniform bright glow, 360 degrees throughout its entire length. They are flexible and cool to the touch making them great for costumes or accents while you dance. 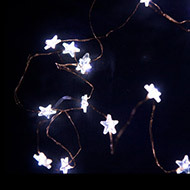 Our Fairy Light Wires offer bright little dots of light on a flexible copper wire that are perfect for decorating. 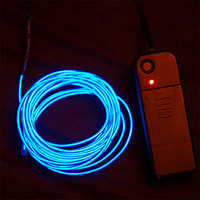 20 color LED's on a thin silver wire with an easily concealable battery pack. Perfect for costumes! The 3 meter Chasing EL Wire now has an same astonishing light-chase effect that looks like a coiled ribbon of light is continuously surging through the wire. Available in 5 colors. 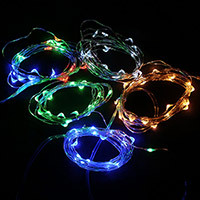 This 3.2mm thick, 3 meter (9.8 foot) El wire kit is a bargain! The small battery powered controller is easily concealed and has 3 light up modes. Available in Blue, Green, Lemon, Transparent Blue, Flourescent Red or White. 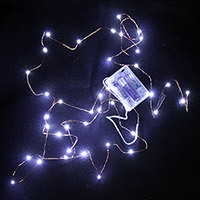 76" LED String Fairy Lights are perfect for Crafts & Costumes. An elegant way to bring a hypnotic atmosphere to any room or occasion. Available in 6 colors! This stunning 6 1/2 ft. flexible wire looks like it has live electricity continuously coursing in a coiled ribbon through it. The unique animated flowing light-chase effect is very eye-catching and totally different from other EL wires. Elite EL Light Wire emits a spectacular uniform light source, like a flexible neon wire. Each Elite Wire has 3 selectable modes: steady-on, slow flash, and fast flash. 30 ultra-thin bright LEDs on a 6 ft long silver wire. Available in Green, Red Warm White or White! 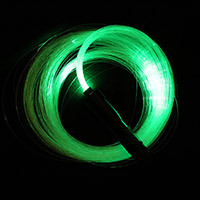 Put on a dazzling light show with this high quality Fiber Optic Whip. This flexible EL Wire emits brilliant neon light with 2 different modes. Great for decoration or costuming use and is conveniently powered by a small battery pack for portability. We are all made of stars! Brighten your costumes or decor with some star power.